From Bankitalia's latest annual report it emerges that the luxury segment is crisis-free and continues to grow at an average rate of five percentage points per year. In the course of 2004 the luxury market closed with a final balance of 134 billion euros spent over the year, with Asia and Japan in the lead. 2005, before the final balance, touched on 143 billion euros - a 7% increase thanks chiefly to the USA and Asia - while forecasts for 2006 suggest a further 7% increase arriving at 153 billion euros. The luxury superyacht market - meaning pleasure craft over 80 feet - is certainly one of the pinnacles of the luxury pyramid and continues to grow in spite of an international economic situation characterised by certain environmental uncertainties. In the course of 2006 the superyacht order portfolio has amounted to an overall 688 units, a 6% growth over 2005. In the last 6 years the luxury superyacht market has grown on average by 14.3%, from 317 units in 2000 to 688 in 2006. In other words, in terms of order portfolio, the international superyacht market has more than doubled in the space of 6 years. These data tell us that this business niche is continually dynamic and attractive within the environmental reference context represented by the top range product market. 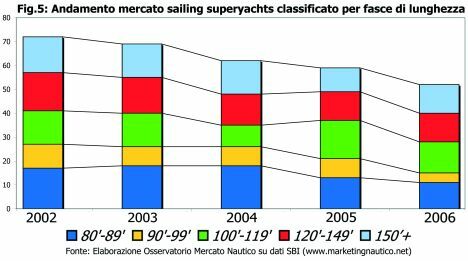 Figure 1 shows the market trend of superyachts classified by the main macro business segments (motor and sailing). As we can see from the figure, more than 90% of the whole market is represented by motor superyachts, the main business area of luxury pleasure craft. 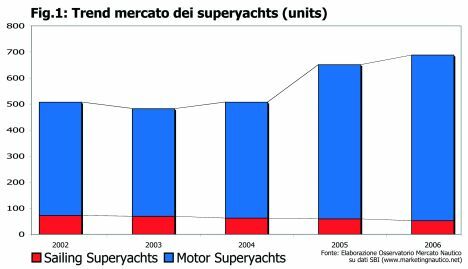 In this context it is important to underline the positive trend represented by custom superyachts (superyachts made to measure for the customer). According to surveys carried out directly by the University of Rome Tor Vergata Nautical Market Observatory, these continue with double figure growth. 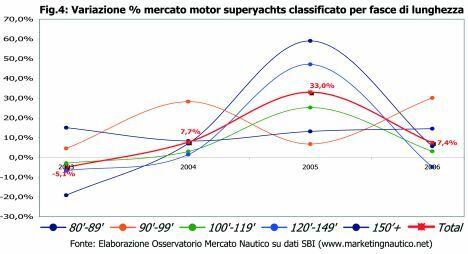 Figures 3 and 4 show the trend and performances of the motor superyacht market classified by LOA. 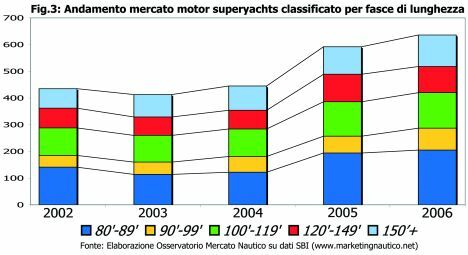 In general terms the motor superyacht market has grown by 7.4% in comparison with 2005. The micro business segments that have grown at above average rate for the entire market are those of vessels between 90 - 99 feet and those greater than 150 feet LOA. It should further be pointed out that the segment of vessels between 80 - 89 feet perfectly follows the general trend, whereas the 100 - 119 feet segment has below average growth. In this context it may be seen that in the course of 2006 there has been a 5% reduction in the order portfolio for vessels between 120 - 149 feet LOA. 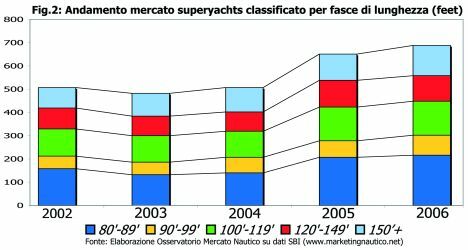 Figures 5 and 6 show the trend and performance of the sailing superyacht market, classified by LOA. Here too we find extremely interesting data. In general terms the sailing superyacht market has dropped 12% as against 2005. Market trends show a macro business segment in diminution, from a portfolio of 72 units in 2002 to 52 units in 2006 (- 28%). The only micro business segment that is growing regards vessels of more than 150 feet LOA, whereas the micro segment represented by vessels between 120 and 149 feet LOA evidences zero growth with an order portfolio of 12 units. All the other micro business segments have dropped in comparison with 2005. In particular the micro segment of 80 - 99 feet has fallen by 15.4%, of 90 - 99 feet by 50%, and of 100 - 119 feet by 19%. At this point it is interesting to note the market share trend of the main Industries - Countries, as illustrated in Figures 7 and 8. 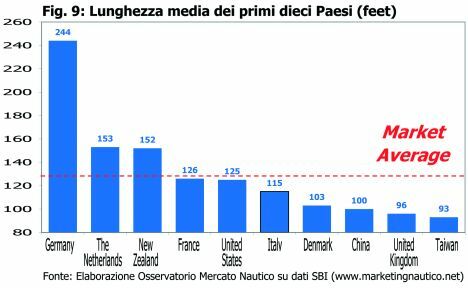 As we can see, Italian shipyards have the position of market leader with a share clearly greater than that of other Industries - Countries. In analysing market share it is important to consider the market both in terms of number of units produced and in terms of length in feet produced with view to defining the competitive position of a specific Industry - Country. 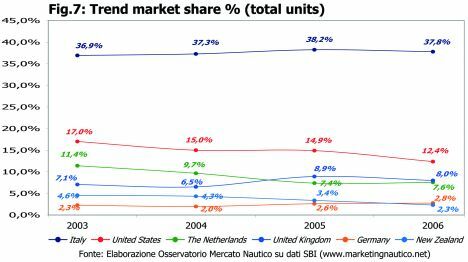 As may be seen from the figures, though the Italian boatbuilding industry holds the position of market leader, in the course of 2006 its market share has fallen slightly, losing 0.5 percentage points in terms of units and 0.9 percentage points in terms of length. These data are evidence of the growing competitiveness of other international boatbuilding industries. Some of the emerging ones are examined below. With regard to the latter we shall do well to focus on each one, emphasising increasingly interesting data. As far as luxury superyachts are concerned, the United States boatbuilding industry's market share is diminishing, having lost 2.5 percentage points in terms of units and 2.2 in terms of length. 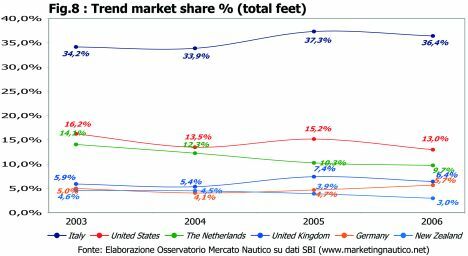 As for Holland, its market share has increased by 0.2 percentage points in units and decreased by 0.5 points in terms of length. The English boatbuilding industry is in line with the other main industries and in fact has a market share that has dropped by 0.9 percentage points in terms of units and 1 percentage point in terms of length. Unlike the Dutch, the German boatbuilding industry has lost 1.1 percentage points in terms of units and gained 1 percentage point in length. Considering these data overall it may be seen that the main boatbuilding industries - though they still have high market shares - are also subject to competitive threats above all from emerging boatbuilding industries which are increasingly acquiring production-technological know-how. Lastly, Figure 9 shows the average unit length for the main boatbuilding industries. As may be seen, Germany has produced on average the largest vessels in 2006, the average length being 255 feet. In second place Holland, with an average length of 153 feet, and in sixth place Italy with an average length of 115 feet. The superyacht market has therefore been once more confirmed as a growing market, complex and dynamic, in which Italian boatbuilding industries continue to occupy a position of leadership. It is legitimate at this point to wonder about the future. It will certainly be an increasingly competitive market in which it is no longer enough to posses production capacity: on the contrary, there will be a need for companies to distinguish themselves from a strategic-competitive viewpoint with regard to ever more threatening international competitors. In recent years a great many vicissitudes have affected various yards whereas many others have nonetheless grown economically at a considerable rate. 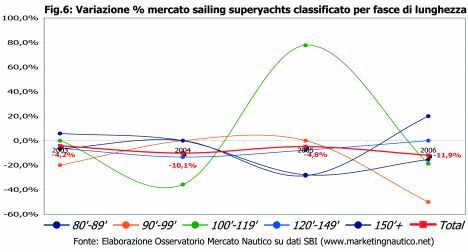 What are the forecasts for the superyacht market? An analysis carried out by the University of Rome Tor Vergata Nautical Market Observatory suggests there is still a considerable gap between effective and potential market, such as to presume future market growth, but this does not mean that all yards will grow: only those who have been able to develop their own competitive advantage. This article summarises a complete market report with detailed analytical illustrations. To request it or for further information contact tommaso.nastasi@marketingnautico.net.